← Who owns the world's most Legos? A US Marine. When billionaire industrialist Tony Stark realizes his destiny as Iron Man he proves once and for all that heroes aren't born... they're built! 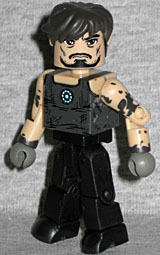 Minimates Series 21 was based on the first Iron Man, so Jim Rhodes is theoretically based on Terrence Howard, not Don Cheadle. We say "theoretically" because the likeness doesn't look anything like anybody. 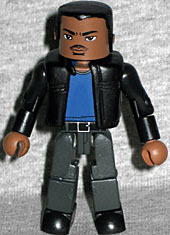 The prototype was closer (if nothing else, it had the right skintone), but the final figure is darker and the placement of his face apps is lower, so he might as well be Alfonso Ribeiro for all anyone will know. Rather than wearing his Air Force uniform, Rhodey is in the clothes he had on when he went to Tony's house to check on him: grey pants, a blue shirt, and a black leather jacket. It's not a very exciting figure, unless you like civilians. The other figure in this set is very exciting, though. It's the Mark I Iron Man armor - you know, the one Tony built in the desert [in a cave! WITH A BOX OF SCRAPS! --ed. ], thus proving his genius. We've already reviewed this armor once, and the things we said about it before are still true. 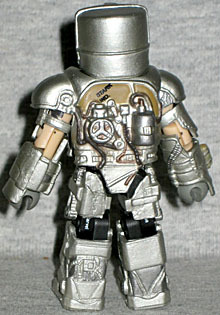 It's still done in 10 add-on pieces and it's one of the most detailed Minimate sculpts ever seen. And since this is based on the movie designs, it's a case where simply painting on the patterns wouldn't have worked. The armor is done in a bright silver, which isn't really right for the film, but it looks nice. To suggest the cobbled-together nature of the suit, there are several small spots of lettering tampographed on: "AF-P4 47S" on the chest, and a tiny "Stark Ind." on the back. You can take off all the armor, revealing the plain Tony Stark beneath. Okay, not really "plain," just "non-armored." Since this is the armor he built in the cave [WITH A BOX OF SCRAPS! --ed. ], the guy inside it is from that same cave. His hair is shaggy and disheveled, he has sunken cheeks and bags under his eyes, his arms are covered with oil and grime, and his shirt looks filthy. Remember, it was almost white when he started wearing it. The arc reactor in his chest is crisp and clear, suggesting there's a hole cut in the shirt to let it poke out. He gets new feet, since the armor's lower legs are all one piece, but still uses the grey hands from before. If you look at the film, Tony was wearing heavy gloves during this scene, so it works. Most impressive is the way the paint detailing continues around his sides: often those apps get skipped. 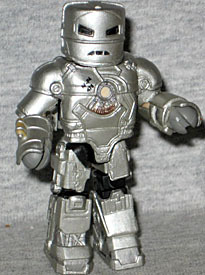 This is the set in Series 21 that came with a variant: the Mark II armor. But since it replaced Rhodey, that would have meant getting saddled with two Mk1s, and no one needs two of those, so no MkII review for you. The Mark I Iron Man is a great figure, though, and brings Carlton up with him. Good review. Though actually, the variant replaces the Rhodey, and not the Mk1.